What Makes Injen Intakes better than their competition? Not only are all Injen Technology Intakes made in the USA, most Injen cool air intake systems feature MR Technology, developed by Injen to maintain safe air/fuel ratio and highly efficient tuning. Injen also does extensive dyno tuning and r&d before releasing an intake, unlike many other companies who take an "if it fits, use it" attitude to aftermarket intakes. 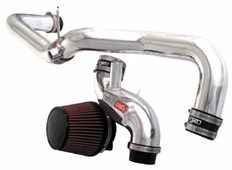 We GUARANTEE the LOWEST price on all Injen cold air intakes!